"If I could afford any designer in the world it would be Chanel! I would like to see if you could find something like this outfit for less. It seems impossible to replicate Chanel on a budget, but if anyone can do it you can! -Thanks-"
So, is this a look you dig? Would you wear it? How about the look for less? Leave a comment! 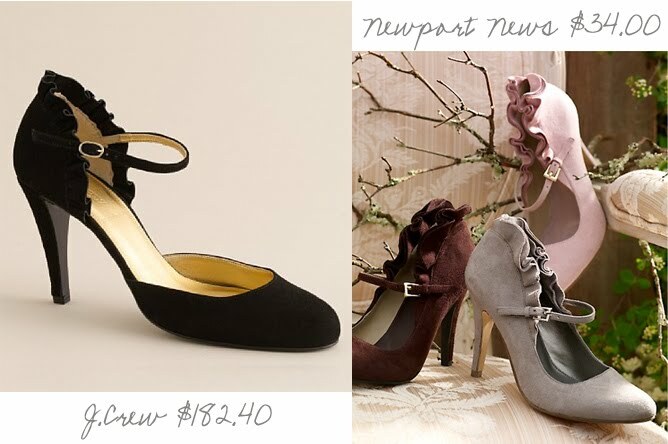 PS - Looking for a kick in the right direction for Cyber Monday deals? Check out the (chloe) conspiracy, she is fabulous at gathering that sort of information. I am more of a "one deal at a time" sort of a gal. 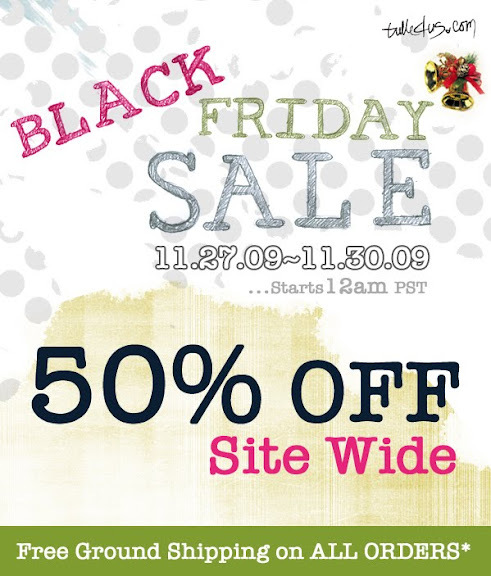 I think I have Black Friday/ Cyber Monday induced anxiety (actually, I know I do). PPS - You may notice some tweaks to the layout of my blog (I went from a 2 column layout to 3), this is all thanks to my ridiculously awesome brother, Aaron. Thanks again! I couldn't have done it without you. Remember when I said I would post again Friday, I lied. I hope you are all stimulating the economy to your heart's content, and having lovely holiday weekends with friends, family, and new consumer goods. 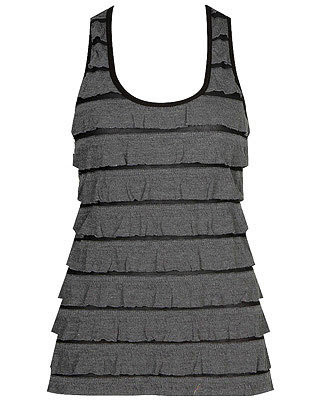 I have been admiring ruffle tanks for awhile, but the thing I really like about this one is that it doesn't completely obscure your shape. You may or may not have noticed that I am kind of attached to my waist (and I guess I better show it off while I still have one, right?) So this, I believe is the answer to that particular dilemma. And its got a little shimmer in case you want to wear it to a fancy or not-so-fancy party. I received [a pair of Harness] Fryes last year for Christmas, but I am having a problem feeling feminine in them. 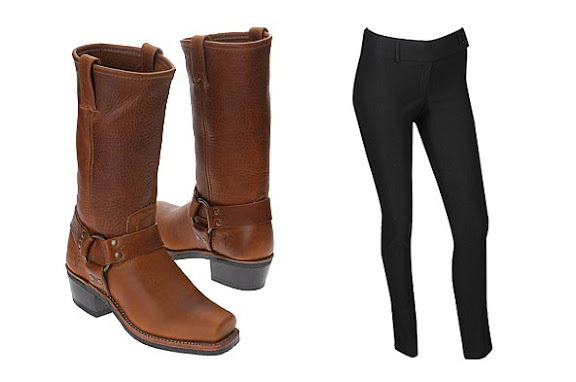 Could you give me an idea of how I could wear these tough boots, without looking like a tough cowboy myself? I honestly never wear or look to wear these type of boots because they are more masculine, and frankly just slightly out of my comfort zone. But, I have a very good friend (Ali) who has a pair of these boots, and they are her go-to footwear option for winter. So, I am taking cues from things I have seen her pair with her boots. I can't take the credit for this look for less. I got an email from Mary from Mary's Wishlist (a blog you should all be reading, because it is fabulous, seriously, I mean it. Read it! :D) She found this look for less and thought it was so good and my readership would love to see it, and I quite agree. Pretty similar no? Mary has a good eye, yes? Go check out her blog. What do you think of the shoes? Something you would wear? Leave a comment! I spied this dress in store. I stood in front of it for 15 minutes, touching the neckline. Isn't it just perfect? I believe this would be the most amazing little black (or grey) dress. What are you dreaming about this weekend? Leave a comment! 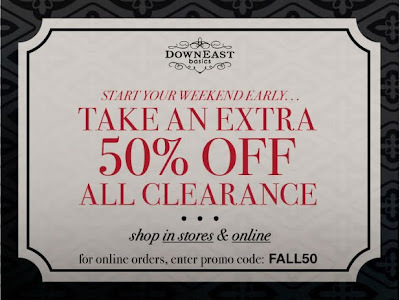 DownEast Basics has come out with a digital version of their Holiday Catalog (view it by clicking). 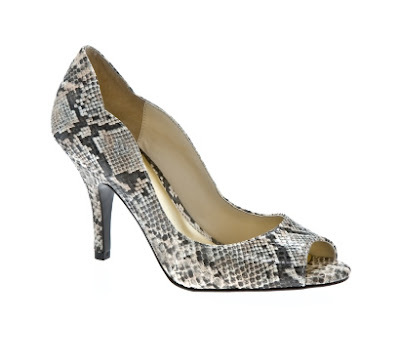 They have a few things that I am eyeing pretty seriously. You guys seeing the J.Crew inspiration I do? I really want that cardigan. No, I need it. None of these things are in stores yet, but hopefully they will be soon. What's your favorite? Leave a comment! Happy dreaming, I mean drooling, I mean shopping! 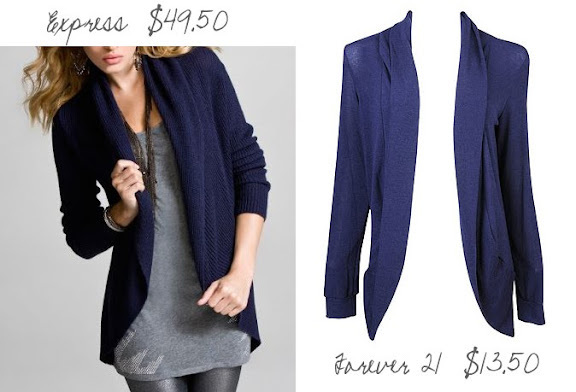 I got another request from Chloe (for whom I did this request), looking for a cheaper version of the Plaza Cardigan from Anthropologie. 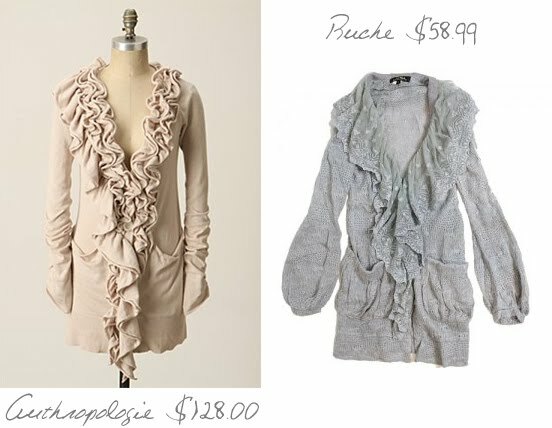 I, of course, didn't find a dead ringer, but I was surprised to find this cardigan with a similar feel from Ruche. If you are a big fan of Anthropologie (and, really, who isn't?) I hope you have checked out Ruche. They have a similar aesthetic at a fraction of the prices. 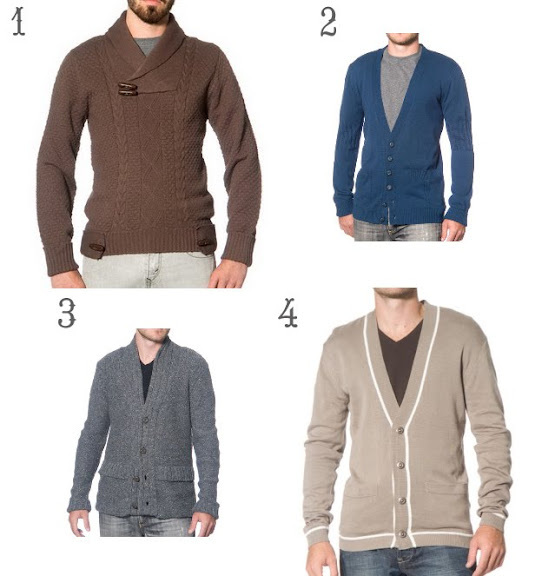 What do you think of the cardigan? Would you wear it? What about the look for less? Leave a comment! Also, just as a heads up, my work schedule is a wee bit hectic this week. I think I will post every day, but it's doubtful that I will be doing more than that. Thanks for being such wonderful readers you guys. I love you all, and I adore your comments. 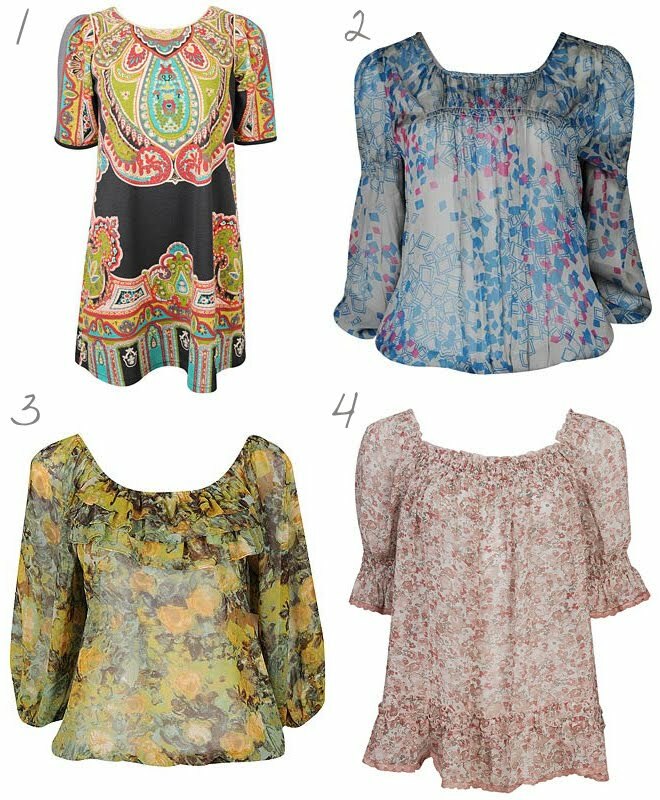 In a continuation of last week's post on how to make a sleeveless party dress modest, I thought I would show you guy's some party dresses that come with sleeves. These are all from local Utah company, Shabby Apple, and are beautiful. And they are all under $100! I love #5 (in Gold), what's your favorite? Leave a comment! Do you all remember the Dare to Design contest from Shabby Apple I posted awhile back? Well, the top 15 entries are in! I think you should all go and vote on your favorite here. Mine? #12! Check out that neckline and you will see why! Let me know what your favorite is, and don't forget to vote, this will be an amazing opportunity for the winner. And many thanks to Angie who commented on my Vintage post from Wednesday that Moriarty's Antiques Curiosity's is becoming Capital City Antique Mall. To commemorate the name change, there will be a huge sale on Saturday 10 am to 10 pm, this means even better prices! Also, all purchases for that day go towards benefiting a music scholarship fund (a good cause to boot!). Visit their new Facebook page or capitalcityantiquemall.com if you want more details. Oh! And J.Crew is offering 20% off of all knits & tees. Find them all here. 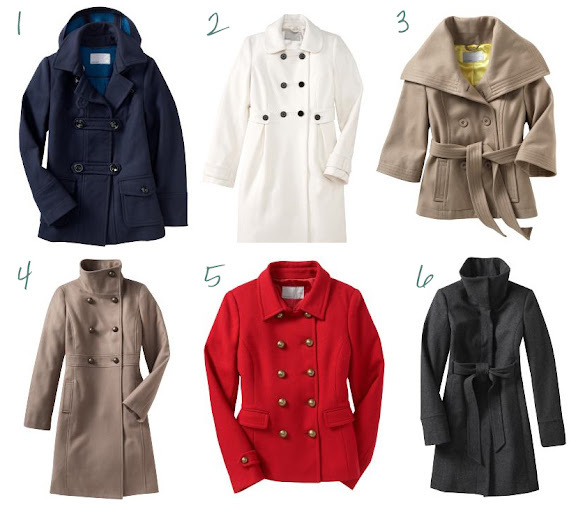 Do I need another coat? Absolutely not. 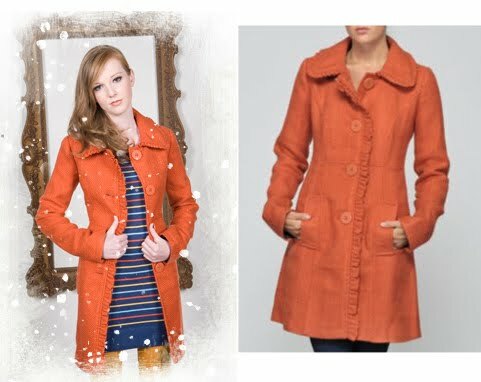 Do I really want my next coat to be orange with a ruffle detail down the front? Heck yes. Check out the rest of their Holiday goods here. What's your obsession this week? Leave a comment! What do you think of the look for less? What about the outfit? Would you wear it? Leave a comment! I have admired vintage clothing for years. 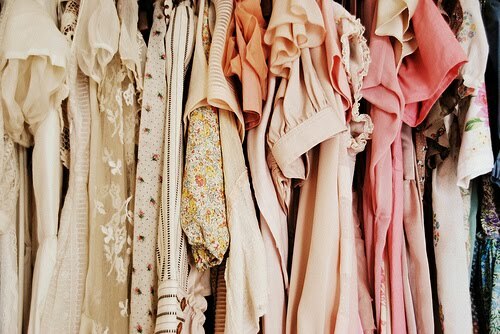 Especially 60's dresses and skirts. 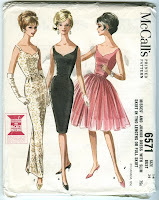 As a child I would go through my mother's patterns and picture myself wearing the fabulous sheath dresses on the models. I have looked for vintage clothes a handful of times at some of the local shops but had trouble finding something worth taking home. I say 'had' because I found the most beautiful chartreuse wool tweed pencil skirt at a little shop called Abode this weekend. It's not really a clothing store, though it has tons of fun vintage goods (including vintage buttons cards for just $1.... this discovery has all but curtailed my new button purchases). I was helping my friend Ali look for suitcases for a photoshoot (for Bella Photos). I happened by a clothing rack and saw a few skirts. As soon as I pulled that skirt out I knew it was going home with me. I even tried it on over my pants in the middle of the store. It was $28, which is a lot for me, but I am sure I will use it for years to come. 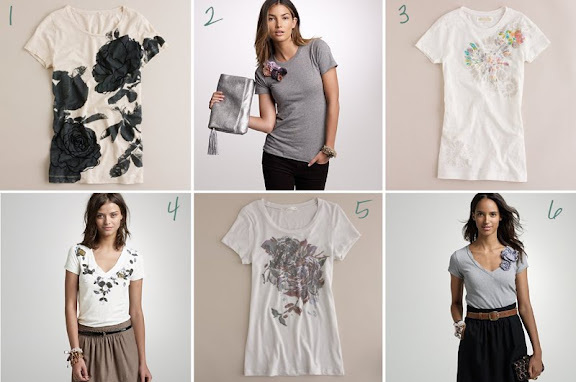 • A positive effect on the environment, as you are effectively recycling garments. • Unique fashion: These items cannot be found in any department store. • Quality: These clothes are well cut, well made and have generous seam allowances for alterations. • Better value: Buying vintage can be cheaper than buying new from designers. • Detailed finish: When a vintage item is examined closely, the craftsmanship is evident. Many items were hand-stitched with superior fabric. Embroideries, unique buttons, beading, crochet, handmade lace and appliqué are all indications of solid craftsmanship. The styles tend to be more imaginative and the creativity is clearly seen. • The story: Wearing a vintage piece is like wearing a living piece of art. Clothing from a different era tells stories about the women who came before us. Certain pieces have heritage attached. This intimate knowledge is priceless. My purchase got me thinking that sometimes people are interested in buying something vintage but don't know where to start. Everyone should visit this store. It's name says it all. I have yet to purchase any clothing here, but the costume jewelry and accessories are to die for (and so are the prices - killer earrings for $3, don't mind if I do). Vintage housewares, furniture, chandeliers, typewriter keys, buttons, etc. Fun odds and ends from days gone by. You never know what you will find! And Abode is offering 20% off all purchase made after 5PM this week! Go check it out. Vintage clothing, shoes and accessories only. I haven't spent much time here, but I have a hankering to get back. Budget-friendly vintage wardrobe pieces in the heart of Salt Lake's vintage district. The layout is more minimalist than overcrowded clothing store. If you live in another community, I suggest you hunt for a few vintage shops and try them out. There is no shopping like rummage shopping! Have you tried to shop for vintage things? Have you found success? If so, leave your tips! I got a request from Rachel (of Shoes & Sewing) weeks ago asking for this Anthro Snakebite belt for less. The truth is, it slipped through a crack in my system, and I forgot about it. Until I stumbled upon a pretty convincing look-a-like by accident. I remembered the request, and the rest is history. What do you think of the belt, is it something you would wear? What about the look for less? Leave a comment! What do you think of the look? Of the look for less? Would you wear it? Leave a comment! I got an email request from Angela awhile back, asking for a little accessorizing help for an upcoming holiday party. 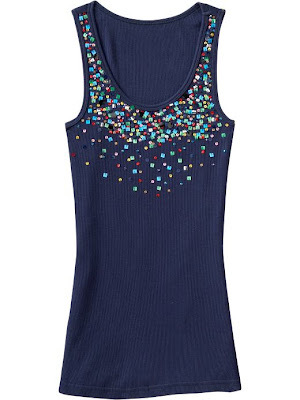 She couldn't find a modest cocktail dress that wasn't black, so she sent me a few sleeveless options with some more pizazz, wondering what to wear with them in order to maintain the formal/semi-formal feel. Next, she was wondering what to pair it with to keep it modest. 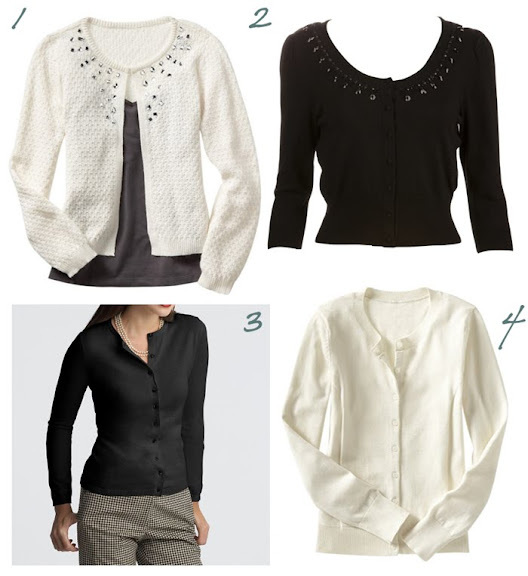 My go-to modesty-maker is always the cardigan. There are a million shapes, colors, and cuts, so they can work with anything, in my humble opinion. What do you all think? What's your favorite combo? Do you have a holiday soiree to attend? Do you know what you are wearing? Me either. Leave a comment! I don't usually post on Saturdays, because I am really important, and I do important things, like laundry. hahahaha. And my new obsession is 8tracks.com. It's internet radio, but with people playing DJ and assembling mixes you can find and listen to. You can join and make mixes of your own, and follow people with similar music tastes. It's seriously addicting. If you want to see what I am listening to lately, find my mixes here. Let me know what you think and what you're listening to lately! I don't usually wear skirts with pattern. I suppose this is because my hips are the widest part of my body. Usually patterned skirts are also cotton and A-line, and I am just not down with what that shape does to my American hips (Is this a real phrase? That's what my husband calls them... he probably made it up... or got it from a country song). But this glorious confection of fashion is a patterned pencil with some structure, can you say perfect? I can. "Your blog doesn't cover men's fashion at all! Where do you suggest we go?" First, I had no idea that fellas other than my dad, brother, and husband ever read this blog. So, let me say Hi Fellas, if any of you are still reading. I will be the first to admit that I am not an expert on men's clothes, for one obvious reason, I am not a man. I do on occasion shop for my husband, but I was wondering if any of you know of some great resource similar to my blog, for the men folk. Or if you want to leave your best resources on finding men's clothes for reasonable prices, I am sure we'd love to read those too! I was looking over the sale section at J.Crew this week, and I saw quite a few shirts I was eyeing this summer and early fall that have made their way to the clearance section. Many of them have that made-at-home by someone with amazing skill look. And someone should take advantage, and then tell me about it. I love living vicariously through you guys! My favorite? #5, hands down. What's yours? Leave a comment! Hey! I just want to tell you that I love your blog. I love the things that you put together and I was wondering if you could help me with an outfit. I bought this lace pencil skirt from Walmart, yes, Walmart... It really is quite adorable, but i can't think of what to put with it... I'm really lost on this one. I could really use your help! First, I do not discriminate against a cute bargain. One of my favorite shirts is a cream colored tee with a pintucked neckline, and I got it for $7 from Walmart. I loves me a deal. I wish I were wearing these, right now. Utah's always pretty cold at the beginning of November. And even if the high temp is in the 60's this week, by the time I recieved these in the mail, there is no doubt in my mind that snow would fall, just to spite me.